The Thanos comic books definitive issue-by-issue collecting guide and trade reading order for omnibus, hardcover, and trade paperback collections. Find every issue and appearance! Part of Crushing Krisis’s Crushing Comics. Last updated November 2018 with titles scheduled for release through July 2019. Marvel has a handful of characters whose appetites for power and wakes of destruction single them out as a pantheon of the deadliest villains of the universe, and Thanos The Mad Titan is chief amongst them. Modern audiences are just as likely to have met Thanos in his cheshire-grinning cameo at the end of The Avengers film as through comic books, but fans of every era of Marvel comics from his 1973 debut forward know of him – even if they’ve never read him directly. That’s because Marvel has used him judiciously over the years, keeping him largely under the pen of Jim Starlin and never making him a regular character, trivial guest-star, or easily-defeated foe. Thanos’s arrival has always been a main event. The result is a tidy, eminently-readable back catalogue of Greatest Hits caliber stories. It all begins in an unlikely fashion – with two anonymous, oddly-colored, muscle-bound aliens having a knock-down, drag-out fight in the middle of an unsuspecting Iron Man issue. Those aliens were Drax and Thanos. While Drax has undergone a considerable update for the modern day, Thanos remains true to that first appearance. 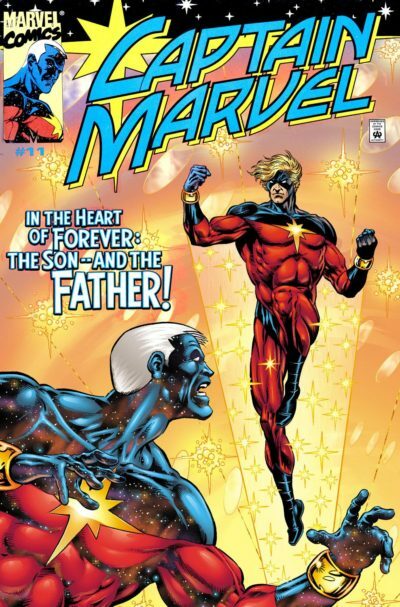 Soon after, he was adopted by Jim Starlin for his cosmic saga spanning Captain Marvel and Warlock, which together account for the first great Thanos story. It’s so great that it spills over to a pair of unrelated annuals for its resolution after Warlock’s title ends. 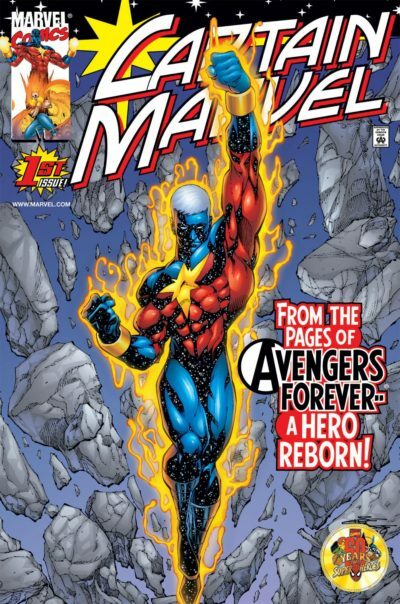 That was it for Thanos for over a decade aside from an interlude in Starlin’s landmark graphic novel, The Death of Captain Marvel. Thanos remained out of play until Starlin took over Silver Surfer in 1990, immediately bringing his favorite obsessed-with-death villain into play. After over a year’s saga of lead-up issues, the result was one of Marvel’s most memorable events: The Infinity Gauntlet, which saw Thanos wielding the legendary weapon against the entire universe of heroes. However, many readers of core titles like Spider-Man, Iron Man, X-Men, The Avengers never even knew Thanos was threatening the Earth! That’s because 90s mini-series events only intruded into lower-selling titles while borrowing top-selling heroes like Wolverine from their own books to boost the mini-series sales. Two more events followed in the same fashion, Infinity War and Infinity Crusade, which gradually twisted the narrative until Thanos was forced to fight alongside the heroes he so often sought to destroy. After another relatively quiet period, Thanos returned (again, under Starlin) in Infinity Abyss and a resulting ongoing series, his first. 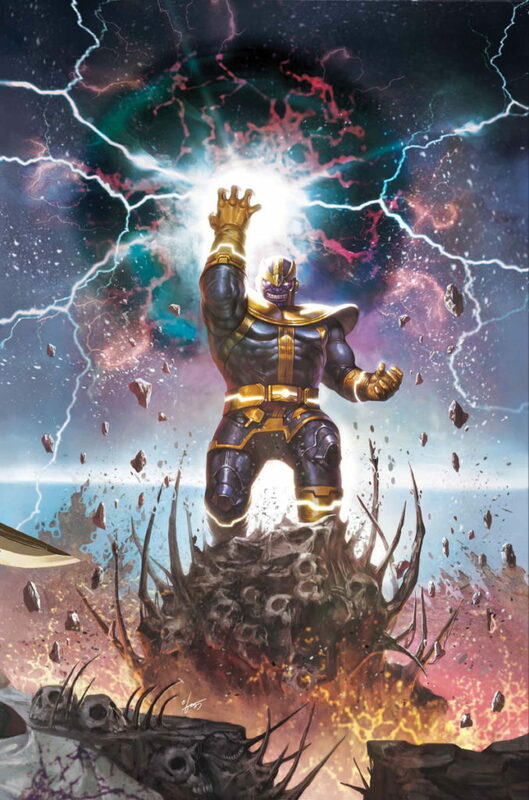 Then, Thanos is thrust onto center stage at the start of Marvel’s blockbuster 2000s cosmic saga, Annihilation, and he reappears to terminate it with The Thanos Imperative. Finally, concurrent with the release of The Avengers and Guardians of the Galaxy films, Brian Bendis and Jonathan Hickman formalize Thanos as a villain who can square off agains the assembled might of the Avengers. For many Marvel readers who hadn’t read the Infinity or Annihilation sagas, it was their first exposure to Thanos. It won’t be their last exposure, as Marvel seems to have plans to keep Thanos visible in their books straight through to his featured role in Avengers: Infinity War in 2018. He has starred in digital series, one-shots, original graphic novels, and his second ongoing launched in late 2016. It’s time to announce and dissect the next five spots from the Most-Wanted Marvel Omnibus secret ballot by TigerEyes. I covered #45-41 in the last installment. This range includes a healthy handful of debuts, plus two books that have drifted downward from last year – both due to coverage in other mediums. Marvel has released these oversized omnibus editions for over a decade now, with a staggering amount of their most-popular material now covered in the format – from Silver Age debuts to modern classics. Is your favorite character or run of issues already in an Omnibus? My Marvel Omnibus & Oversized Hardcover Guide is the most comprehensive tool on the web for answering that question – it features every book, plus release dates, contents, and even breakdowns of $/page and what movies the books were released to support.